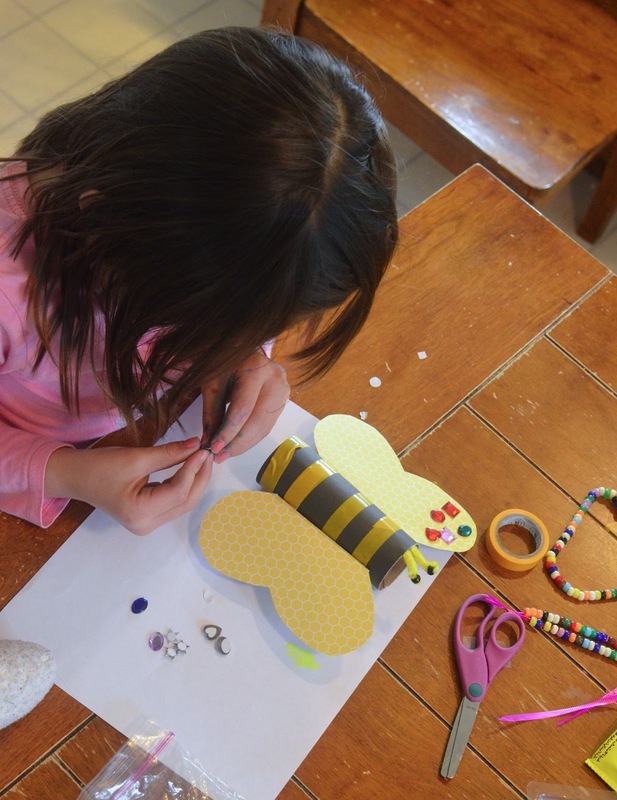 This is my sole cardboard offering at Kate's Bug Party: a flying bug. 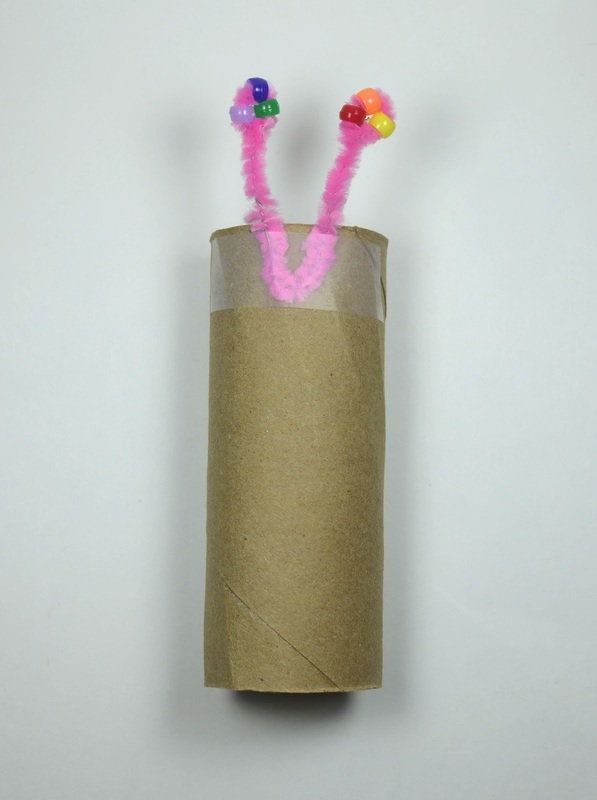 Essentially, these are cardboard roll critters that slide along a pair of zip-line-style cords. 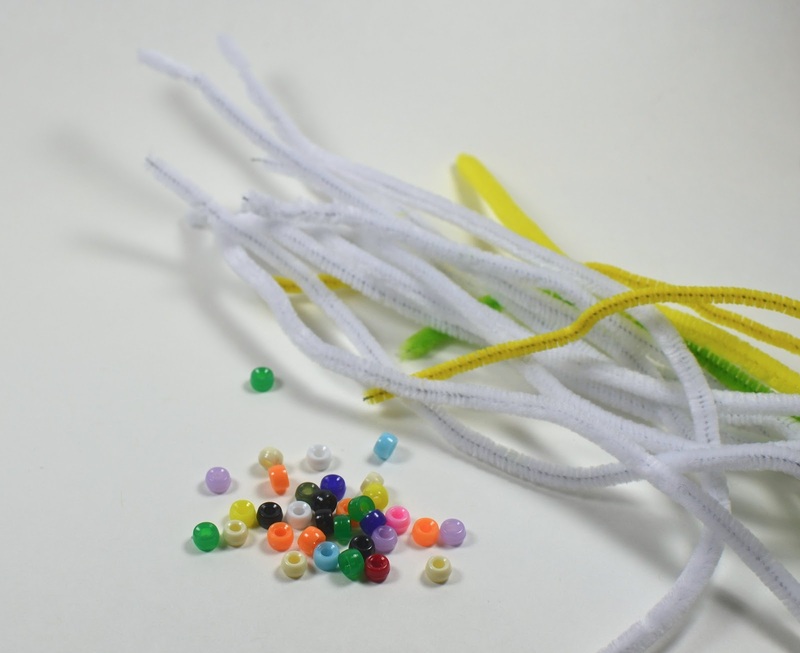 Very easy to make and fun to play with. made into antennae for the critter. which was then covered up with nice paper (we used scrapbooking paper cut to size and glued on). 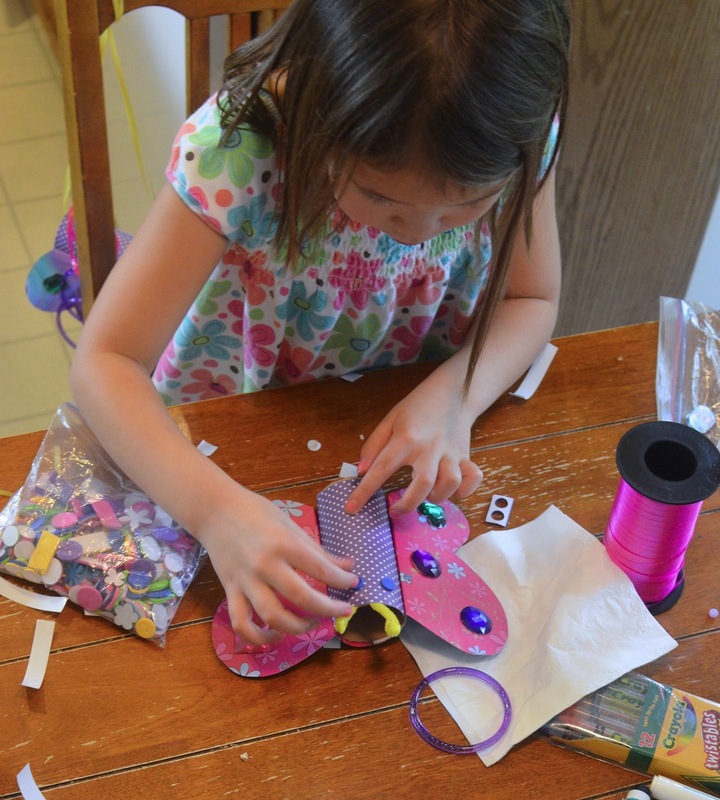 Then we cut out a wing shape out of more scrapbooking paper. Except our wing shape had an additional rectangular section in the middle, which will be wrapped around the back half of the roll. This critter was going to be a butterfly. like so. Notice that the back of the wings is white, because our wing paper was single-sided. 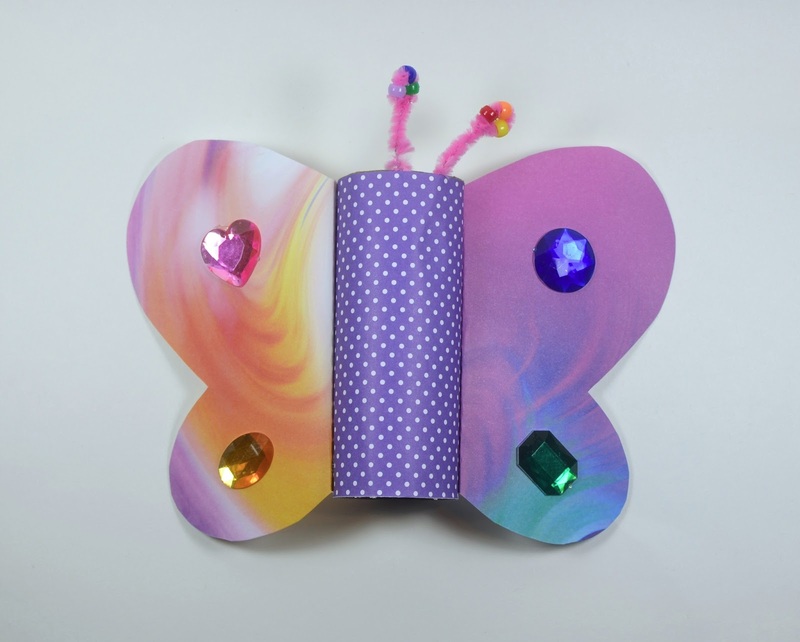 We also used double-sided paper, which gave us colored (or patterned) wing backs. The wings could be glued or taped on. 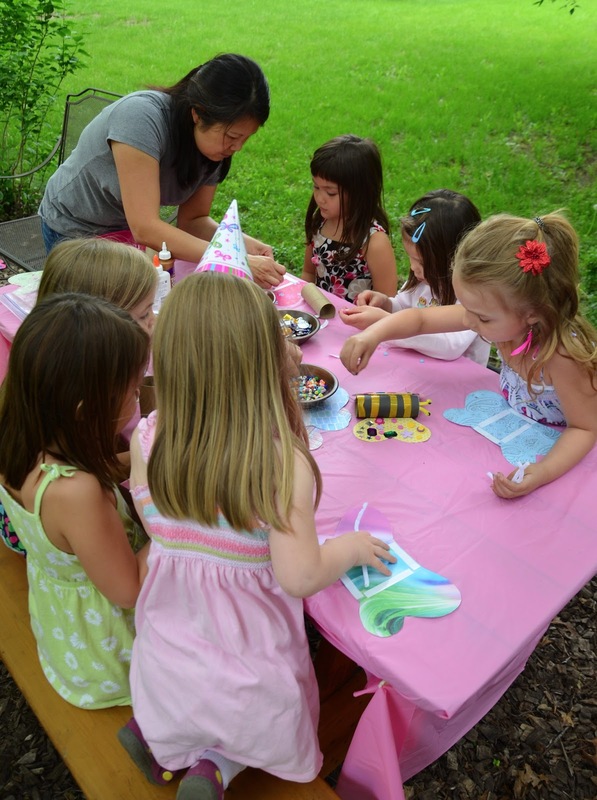 For the party, I prepped the wings with double-sided tape so that all the guests needed to do was peel the backing paper off the tape and wrap-stick the wings around the back of the cardboard roll. Less messy. 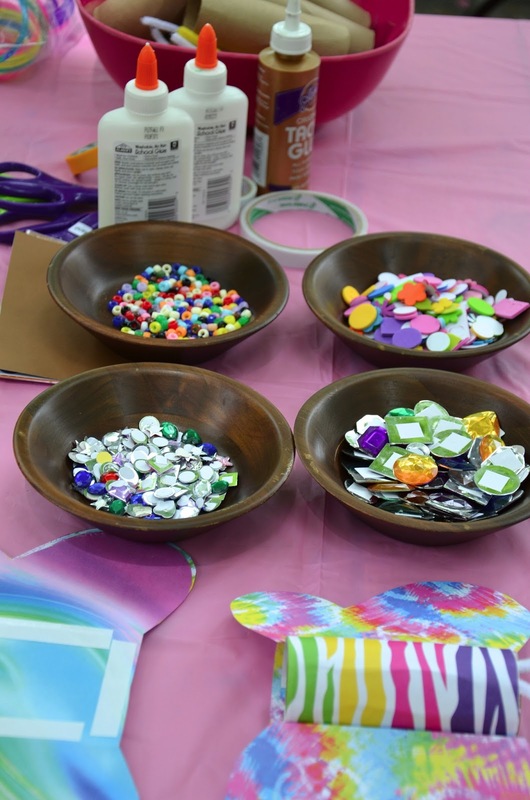 which we provided at the party, along with foam stickers and markers for embellishing. 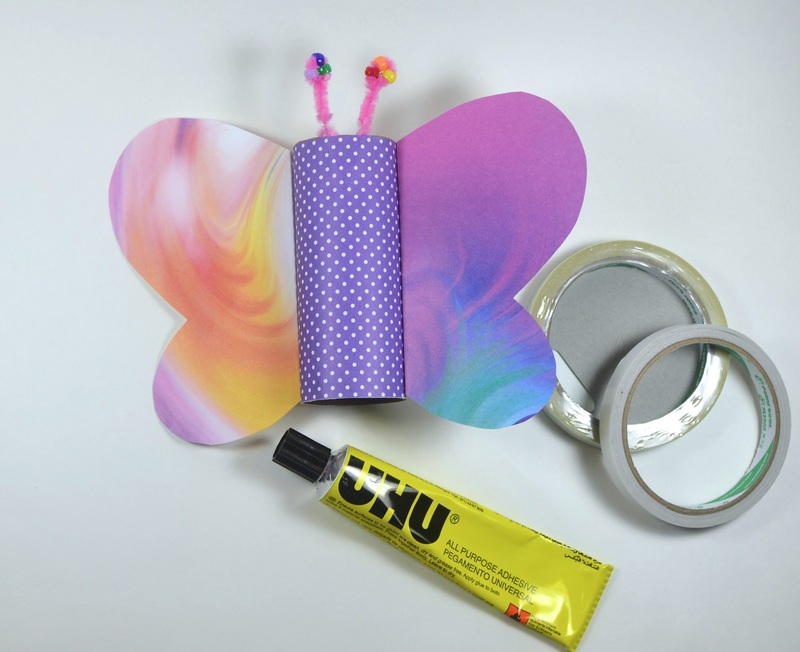 In the photo below, you can see the double-sided tape strips on some of the wings. 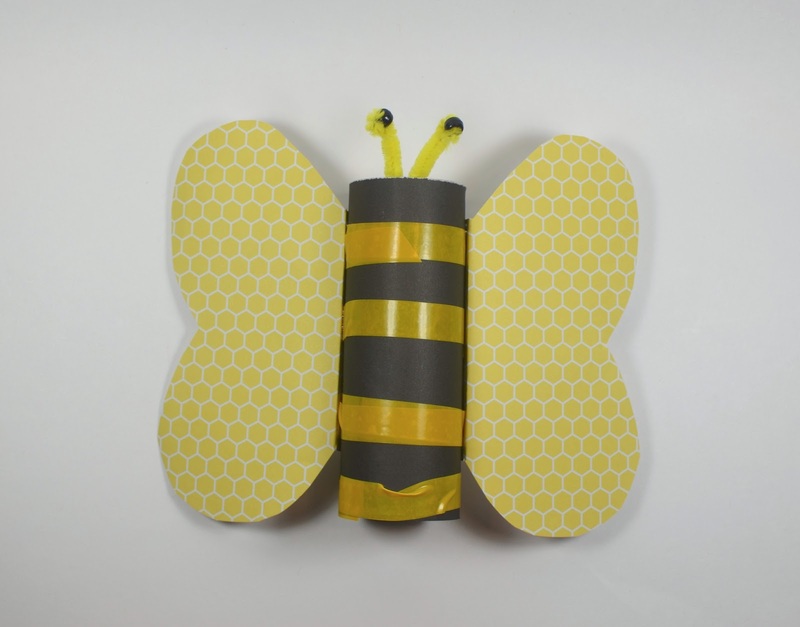 Here is another version - Kate made this bumblebee. in an earlier test-run for the party. Now we turn the critter into a toy. All you need is some string, really. 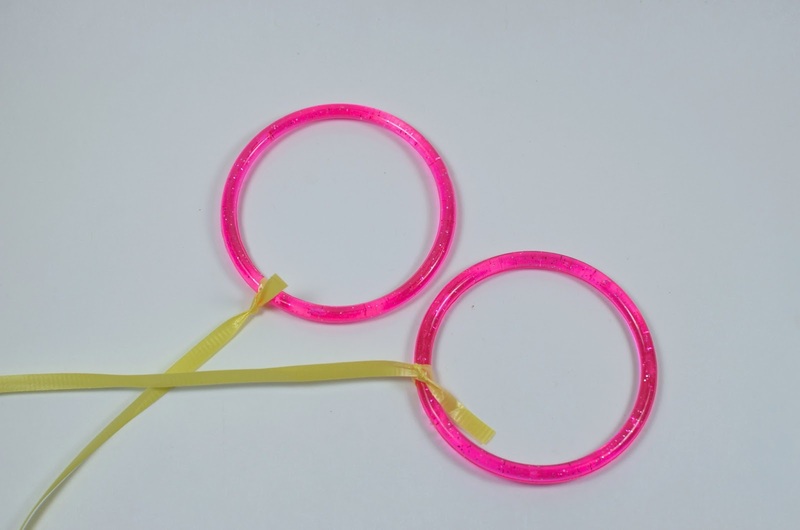 But we added some dollar-store bangles for handles. 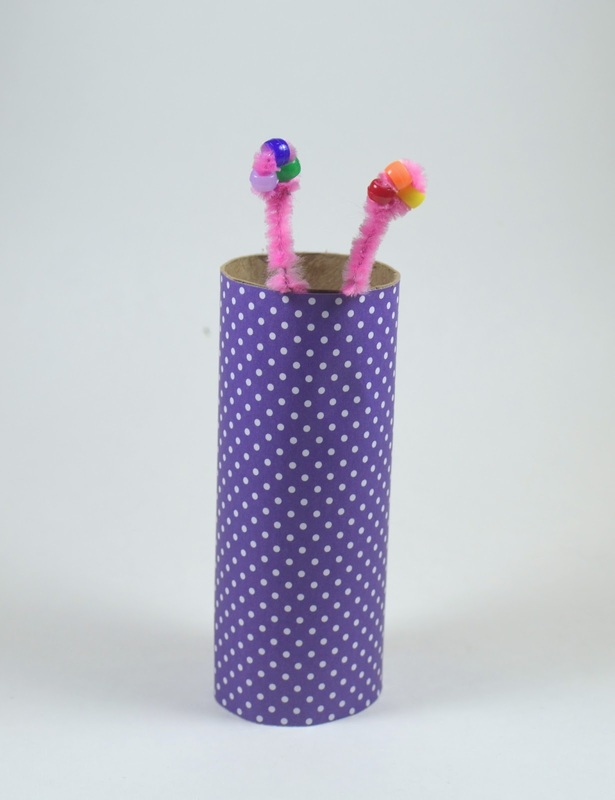 Two reasons: one, because they are more interesting to hold on to than just the ends of the string and two, being larger than the diameter of the cardboard roll, they prevented the roll from sliding off the strings completely. 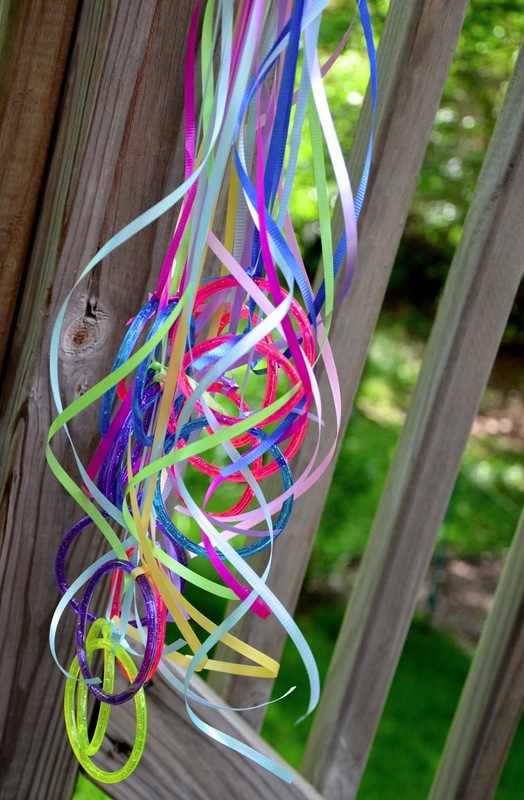 For the strings, we used curling ribbon - pretty and inexpensive. 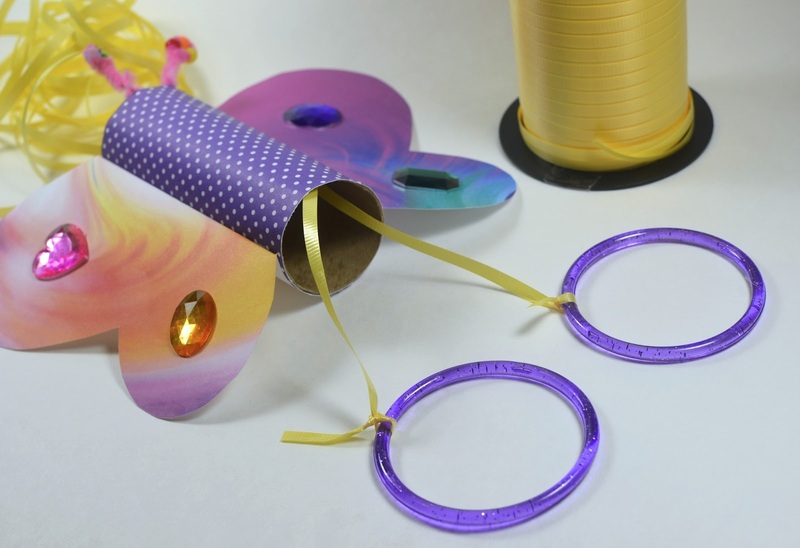 Cut two same-length strips of curling ribbon (or string) and tie one bangle to one end of each ribbon (or string). 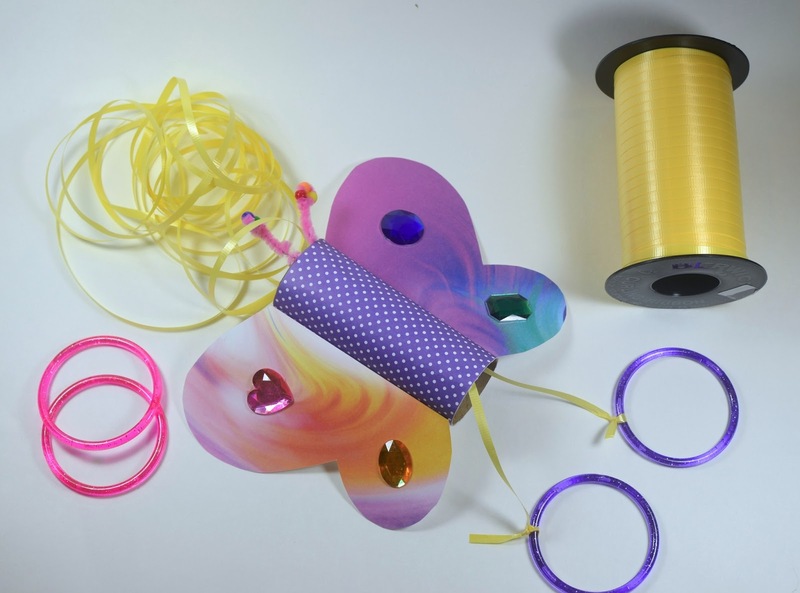 Then thread the other, free ends of ribbon through the cardboard roll. 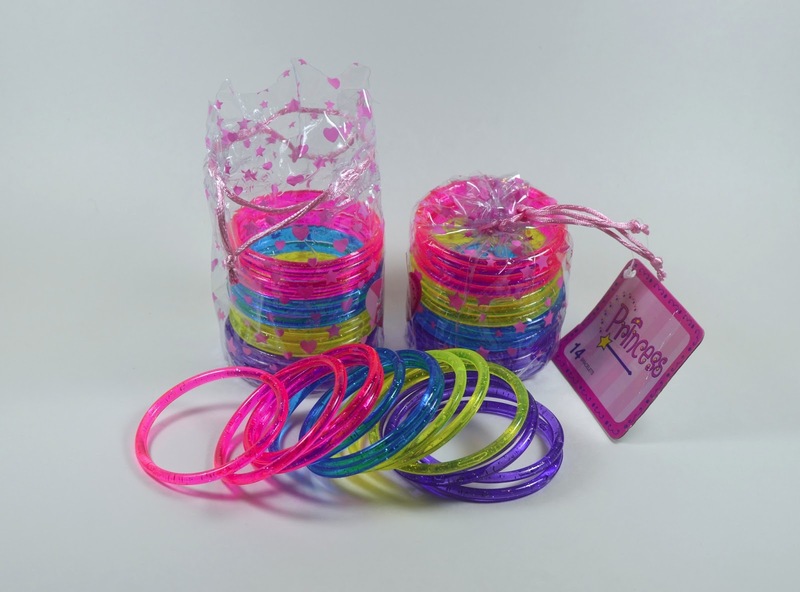 Tie those free ends of ribbon to another pair of bangles. This is the finished toy. with the other pair either secured to something or held by a friend. 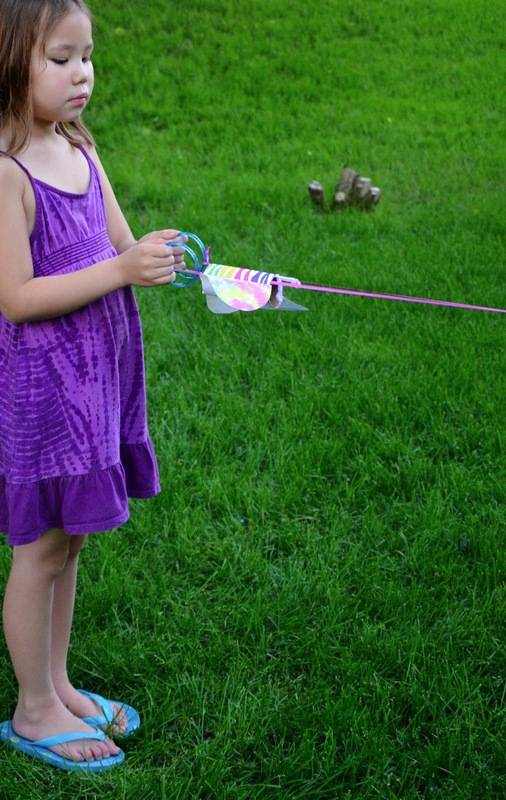 Then quickly pull your arms apart so the critter zips along the string/ribbon to the other pair of handles. 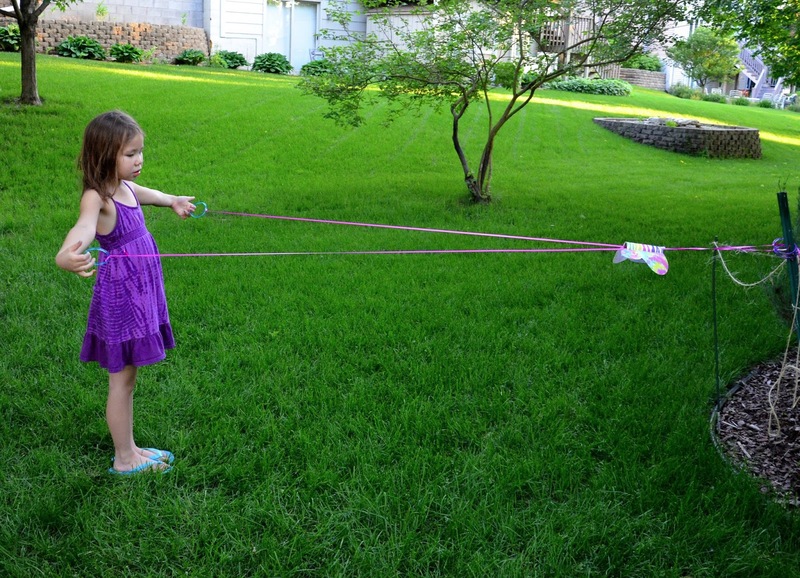 If played with a friend, they now repeat the action (while the first person brings their handles together) to return the critter to the first person. Here is a short video of Emily demonstrating how this works with a single player. It takes a little practice to get the cardboard roll to slide smoothly and completely to the other end of the ribbon/strings. We found it best to pull the handles apart quickly, but not stiffly - the smoothest motion occurred when there was a little slack in the strings. 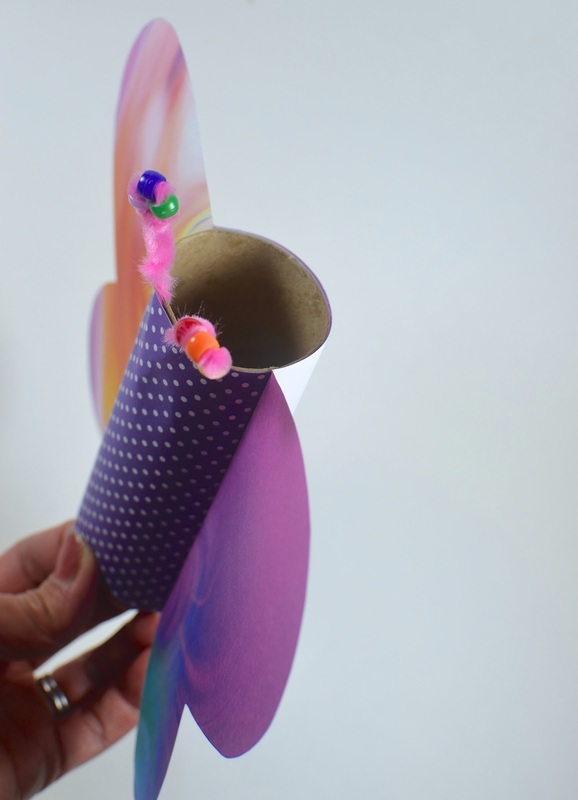 Cardboard roll projects are so versatile! 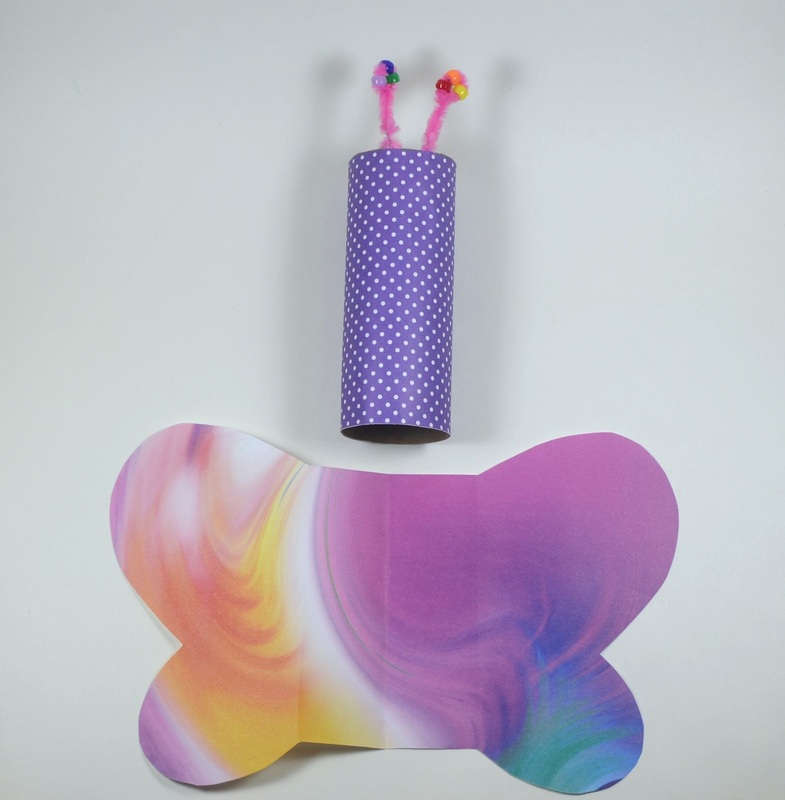 For instance, were this not a toy, we might have turned the butterflies into candy containers by sealing up both ends (with candy within the cardboard roll) with paper. 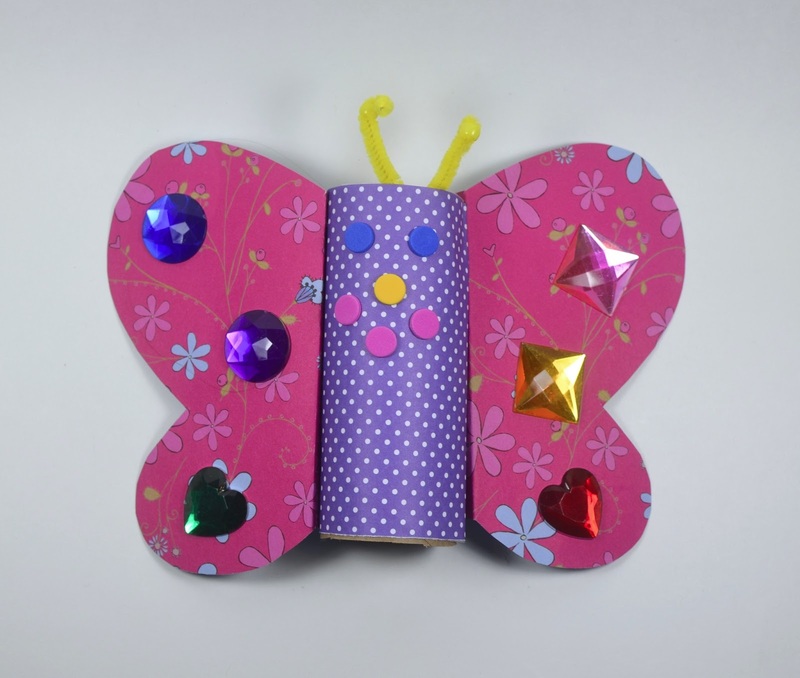 Also, this being a Girl-Bug-Party, we turned our cardboard rolls into butterflies. 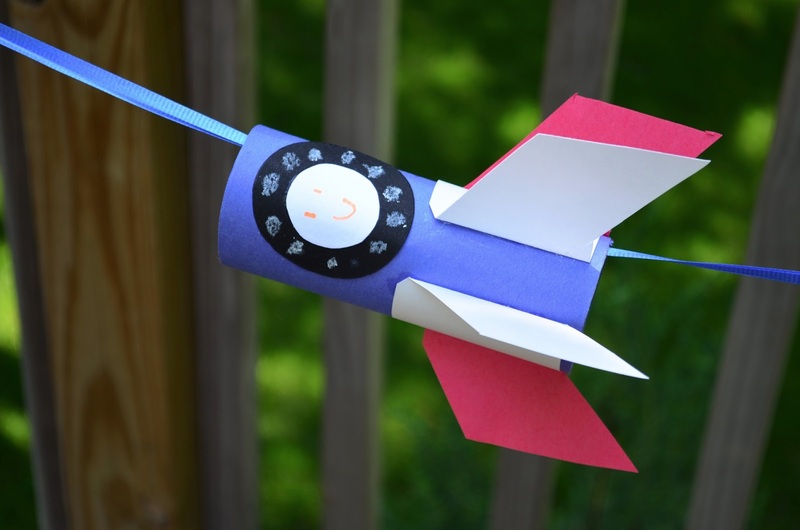 This toy can also be adapted to many other forms: rocketships, squids, birds, arrows, missiles, space shuttles, flying superheroes, aeroplanes ... endless possibilities! So simple yet so cool! 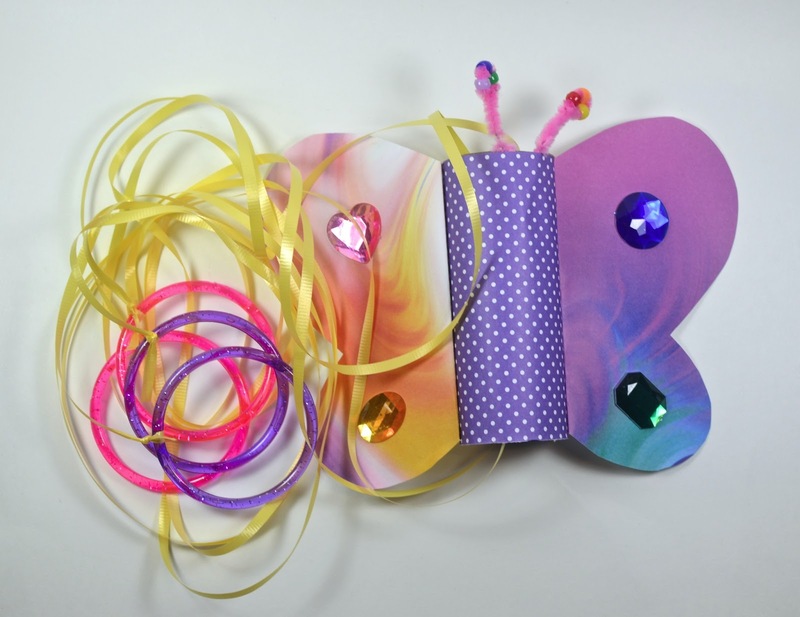 Such a simple and fun craft activity. Low mess too - which is a definite added bonus in my books. 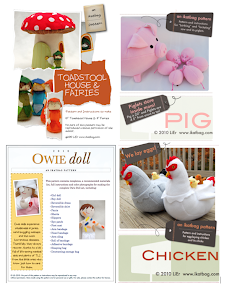 We've got our long summer holidays coming up and I think we might have to try making a whole range of these. Thanks for the instructions. You have such great ideas! 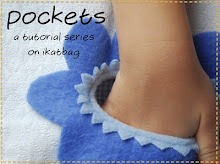 Reading your blog inspires me to be creative with my kids as well. Thank you! LiEr, did you manage to buy gems with the adhesive already on them, or did you have to make your own with double sided tape? but can't remember where the big ones are from. Sorry. LiEr, I never fail to be amazed at your incredible generosity in sharing your knowledge and ideas, and taking the time to respond to endless questions. Thank you so much for taking the time to respond to my question.